Gail’s mom lived alone in the 2500 square foot suburban ranch style home that her parents purchased in 1973. After her father died, Gail tried to talk to her mother about moving into a town house or patio home within walking distance of her church and local shopping but Amanda Davis would not even discuss it. The house was paid for and her neighbors had been extremely supportive since the death of Gail’s dad. While Gail acquiesced to her mother’s wishes, she believed there were better living situations for her mother. But she also recognized that her mother was an adult, she was financially independent and her mind was good so she was fully capable of making her own decisions. Then Amanda fell. After repairing both her right wrist and left ankle, the surgeon announced that Amanda was now in what the medical profession called a falling cycle. Gail watched with alarm her mom’s response to the doctor’s pronouncement. Instead of trying to improve her balance and strength through physical activity such as yoga and water aerobics, she simply sat down in front of the TV and rarely moved. Gail felt helpless as she watched her mother become isolated, frail and lonely. Conversations with her mom were stilted and brief as her mother’s world became limited and just plain dull. But Amanda refused to budge. Gail started talking to her friends and neighbors and discovered that she was not alone. It seemed to Gail that everyone was struggling with an aging parent. But the thought kept coming back to Gail, how can my life be different as I age? I don’t want to just “plan” for my old age; I want to think differently about that time of my life. How can I think creatively about how I am living? How do I keep from getting attached to a past lifestyle that no longer makes sense for me? How do I stay as engaged with my family, friends and community as my body starts to slow down. Gail didn’t want to end up like her mom, alone and disengaged from the world around her. Gail wanted to craft a different aging experience so she set out to answer the question, how do I think creatively about all stages of my life? And if she could learn how to think creatively about her life, she believed her experience would be different and hopefully more positive than her mother’s experience. 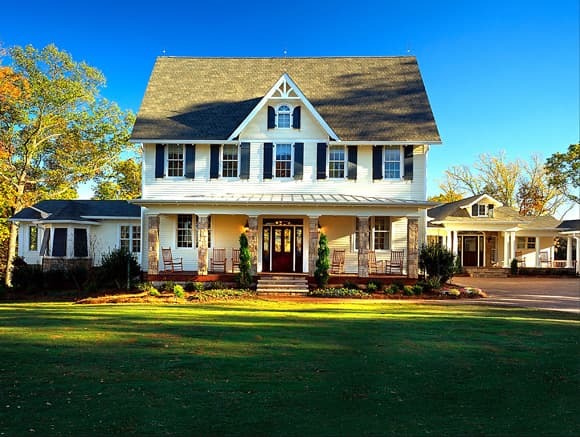 The warm and kindly tradition of multi-generational living has been a part of the American home since colonial times. Now, the time for multi-generational living has come again, more gracefully and more stylishly than ever before. I’d like to share a few words about multi-gen home and then take you on a pictorial tour of my favorite multi-gen space. Let’s also look at how make your multi-gen spaces warm, functional and empowering, if not healing as well. From my childhood neighbors in Florida and their live-in ￼granny to my Italian neighbors here in New Haven, I’ve always enjoyed families where the generations live together. Thus inspired, my design team has included various forms of multi-gen spaces: in-law apartments, guest cottages and “swing spaces” in custom homes since 1981. Now, more people are requesting them. My studio designed a new plantation style Show Home with whimsical island touches. 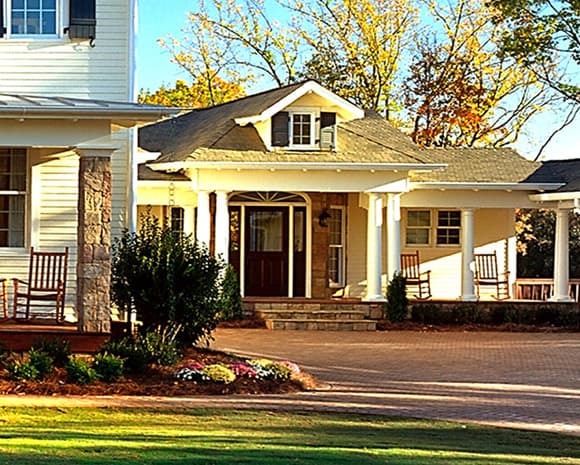 We included within it, a multi-purpose, “multi-gen“ cottage and an attached carriage house-garage (not shown). Together these parts fulfilled our commission to create the forward-looking 6, 430 SF “New American Home 2002 “. Even though The New American Home 2002 aka TNAH 02 was built all at once, I designed the multi gen space to give the illusion that it might formerly have been a freestanding cottage that got linked to the main family house over time. The “cottage” is on the right hand side of the house and towards the rear. It’s located between the kitchen and the garage (where a ramp can be added). Placing the cottage near the kitchen and family room where the family is likely to congregate lends a warm and inviting connection to the main family house. Connection is balanced with autonomy. At TNAH 02, you cross a porch and hall to reach the cottage. This semi-private entrance porch and hall maximizes the independence of the cottage dweller as does its location next to the laundry room. 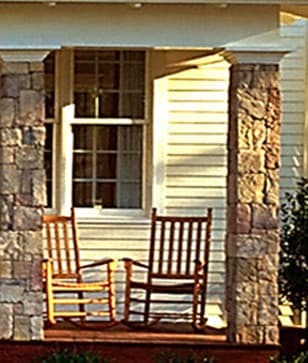 By the way, this porch doubles as an informal “friends and family entrance” to the entire house. Inside our multi-gen spaces, wide, wheelchair accessible doors feel generous as they lead into the multi-gen rooms. Easy to use lever door handles set the stage for hardware solutions that are seamlessly integrated. Inside, there’s a cheery, resort-like setting. Super-sized widows take advantage of the view and bring in lots of light for one whose eyesight may be failing. The white decor also brightens the room for all, including those whose vision could be better. Areas for sleeping, reading, bathing and dressing are designed as stylish accommodations whether for an aging couple, a disabled person or guests. You’d never notice that spaces beside the bed and chair are sized for independent wheelchair access. What you notice instead is that being there truly feels like being on vacation or beginning a new life chapter. The wheel chair accessible bathroom deliberately avoids any hint of an orthopedic or clinical appearance. There are no depressing reminders of physical limitations. There are no cheap or sterile looking spaces and no things such as ugly shower chairs, odd grab bars, and strange toilets. In fact the modern look of the ￼accessible lavatory and the “roll in” shower are downright stylish. This multi-gen place does not convey the message that an aging parent is “on a downward slope”. Such a message surely delays recovery and may accelerate a loved ones mental well-being. Typical sick room décor surely depresses a homes resale value as well. I wish I had been given more say about the storage area. It’s asking a lot of an aging parent to sort through and give up their possessions. With that in mind, the dressing ￼room-closet should have been more than twice as wide so clothes and things could be stored on either side. Nonetheless, I still like the pivoting hanging bar with attached handle. It brings clothes down to easy reach. Its also a good choice for children or to add an extra row of storage for anyone with high ceilings. TNAH 02 was built to showcase the treasure trove of materials and products that are offered by sponsor members of The National Council of the Housing Industry, NAHB. Crowds of idea seekers toured the home during the annual Homebuilders show, includung a family who purchased the home. One of their main attractors: the multi-gen “cottage”. It seems that they wanted a beloved in-law to move in with them. Whether your multi-gen space is a room within an existing house, a suite of rooms with a house or a free-standing cottage, it helps to think of multi -generational spaces as a way of easing the many life passages that people experience. You are helping by giving them a special nest within your cozy home. Design these spaces in the interest of empowering those who are aging or temporally incapacitated. Decorate them to give a joyous and uplifting experience for those who may be passing thorough. When it’s time to sell your home, you’ll be doubly happy that you did. The rest of the home will soon be posted at www.melanietaylor.com and on Facebook under the fan page for Melanie Taylor Architecture & Interiors. The home was featured in Builder, winter 2002, House Beautiful--Home Building, summer 2002; Home Remodeling and Decorating, summer 2002, and Kitchen and Baths, summer 2002.
Who's Holding the Keys to the Car? Jim Sharples woke one morning to find that his wife had died quietly in her sleep. He was now alone for the first time in 50 years. Jim was a disciplined man. He had worked hard all his life and was a fiscally responsible person. Jim’s three children respected him and had never questioned his decisions. So after their mother died, they watched silently as the routine he followed for most of their life started to breakdown. Jim stopped going to the gym, he started relying on others to do the cooking and he became frail using a cane and then walker to get around. When it came time for their father to renew his driver’s license all the children knew that their dad should not be driving. Jim’s oldest daughter, Janie, lived in another state 400 miles away and she listened patiently on the phone to her siblings as they expressed their concerns about their father's driving. But in the end, Janie left all the decision making to her brother and sister. At one point, Bill, the youngest, removed all the car keys from Jim’s home and stated emphatically to his father that he should not be driving. The result was a war of words and nerves; the entire family was in a constant state of tension with Jim angrily declaring that they had no “right” to keep him from driving. Finally, Ruth, the middle daughter, unilaterally decided to take Jim to the DMV to renew his driver’s license and end the family drama. Ruth was sure that the officials at the DMV would take one look at her father and THEY would tell him he could not drive. Ruth stood by, in amazement and horror, as her father passed the eye test and was told to meet the examiner out front for his road test. Jim managed to get his walker in the back seat without help and after the examiner settled into the front seat; Jim confidently put the gear in drive and drove his car straight into the DMV building. Fortunately, no one was hurt and the damage to the building and car was minimal. Justifiably, Jim’s driver’s license was not renewed and he never brought up the subject again. Jim’s children now recount that story with humor and relief. They no longer struggle with “how to tell Dad he can’t drive any more.” But what about the rest of us, to use Jim Sharples word, many people believe driving is a “right”. In the United States, a driver’s license is recognition that we are capable and sensible enough to operate a motorized vehicle and as teenagers we strive to get our licenses as soon as possible. Our car symbolizes freedom; it is freedom to live anywhere we want, come and go as we please and declare who we are through make, model and color of the car we drive. So it should come as no surprise that as we age, we desperately hold on to our driver’s license and our cars. At Footsteps we submit that the discussion is not just about driving; it is more holistic than that. The question is how are we going to live as we age? The Census Bureau states that by 2050 people 65 and over will comprise 21 percent of the U.S. population. Almost one forth of the population of the US will be struggling with the emotional and practical side of aging. Sadly for the families involved, these stories are becoming all to familiar as are the pleas of family members asking for help as they struggle with out how to tell mom or dad they no longer should be driving. At Footsteps, we want to work together to help you navigate both the emotional and the practical aspect of aging and driving. Together we will explore when to stop driving, how to discuss the issue with those we love and what are the alternatives.